From seeing this I am a firm believer that the combination of having Google Authorship setup and having an active Google+ account that are in a lot of circles gives pages authored a strong weight in the SERPs. It would make perfect sense too, I mean what better vote of confidence could Google acknowledge than vote in an author. Its much safer for Google than trusting links too. Being in 200 circles of influential people (people that are in a lot of circles) indicates that you are an author to be trusted, but not only that your account and all of their accounts are fully verified by Google – they probably even have the correct mobile number for most authors. The fact that the webpage has to link to the G+ profile and the G+ profile has to link to the webpage makes it near impossible to game. No one wants to put on their Google+ profile that they are associated with a site just to give that site a boost; in the majority of cases users will only do that when they are genuine authors.�It would also be nearly impossible to create dummy Google+ accounts to use on pages to give them authority as it would be crystal clear to Google what you were up to when they saw that no Google services were being used. Further to this I am in the process of finishing a new site and being it is on WordPress it’s super easy to add structured data using the right plugins and theme so in no time I set-up breadcrumbs, review ratings and also set-up Google Authorship while I was at it. Almost immediately after I started getting traffic, and�bear in mind that I have not done any intentional link building (there are perhaps a few nofollow comment links out there). 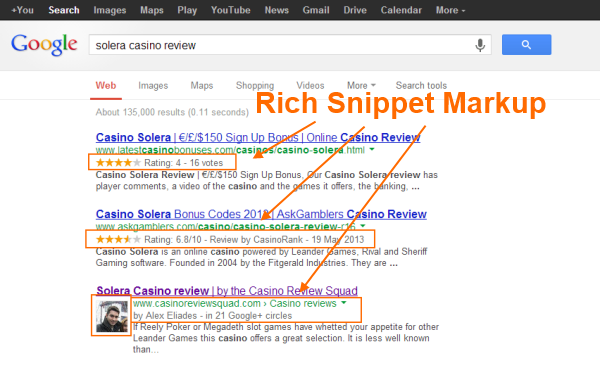 This made me jump up and down a bit and the penny dropped, it was because of Google+ and structured data alone. Traffic has now surpassed my other gambling site that is 3 years old and has over 2,000 backlinks pointing in but got hit with a penalty a couple of months back. Literally as one site has been hit and the ship is sinking the other one came to life. I’m not saying that we should forget inbound links as there are clearly a whole hoard of sites that rank because they have great inbound links but it is now clearly much more than building links. Now we have to focus on structured data, social profiles (especially Google+), user engagement, great content, branding, usability, likes and other social signals as well as good old fashioned links.�It’s funny how things change, I am even now engaged in link pruning in order to improve rankings!